Those who watched the suspenseful Breaking Bad season 5 midseason finale saw Walter White's brother-in-law, DEA agent Hank Schrader (Dean Norris), piece together the identity of the mysterious maker of blue meth. As it turns out, Mr. White (Bryan Cranston) hasn't been as thorough in tying up his loose ends as his aggressively protective demeanor leads everyone to believe, and a poorly placed piece of bathroom reading is just the beginning. In total, Walter White has 22 loose ends threatening to bring him and his criminal empire to an end. Fortunately, there's no need to scratch your head or count them off on your fingers, as the infographic below includes them all. 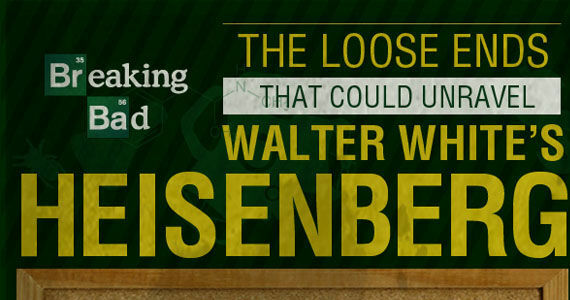 From the most obvious to the most surprising, the infographic shows that Walter White is going to need to clean house when he returns for his final bow in spring 2013. While Walter White may have once been the mild-mannered chemistry teacher wanting to provide for his family, five seasons of Breaking Bad have transformed him into a vengeful drug kingpin who many now fear. But will that fear cause them to turn on him? Because even though Hank knows that Walter White is Heisenberg, he still needs the evidence to prove it. Which of Walter White's loose ends do you think he should tie up (or "tie-up")?